New American Press, 9781941561010, 254pp. 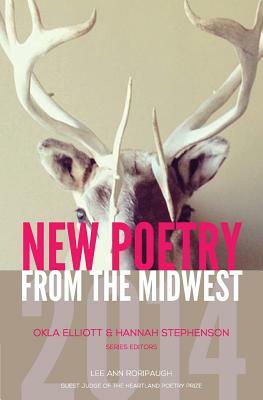 The New Poetry from the Midwest anthology seeks to support and spotlight the flourishing crop of Midwestern writers who consistently produce work that is innovative, finely crafted, and strong in voice and the ability to connect. We do not intend to create a collection that presents our region as possessing a singular style or narrow range of content. "Midwestern" is a term that is vague and diverse in meaning, and we wish to seize on that. Send us poems that you love and are proud of: explosively or subtly powerful, committed to their own vision, sure-footed in their language. We want poems with heart. We also want to explode the generally accepted notions of what the Midwest is and what Midwestern writing is, while honoring its rich and long-standing tradition(s). What counts as poetry of the Midwest? We welcome poets who currently live in, pursued an education in, or were born in one of the following twelve states (Illinois, Indiana, Iowa, Kansas, Michigan, Minnesota, Missouri, Nebraska, North Dakota, Ohio, South Dakota, and Wisconsin) and poets writing about any of these states, or the region as a whole.